Looking for the best driving school in Seattle? You have several choices, but SWERVE Driving School is your best choice. 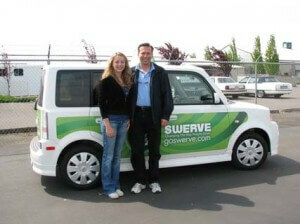 What makes SWERVE Driving school the best choice for drivers education in Seattle? SWERVE Driving School’s curriculum content and support materials are current and lively. Classroom material is organized so that it supports what teens are learning behind the wheel.SWERVE Driving School’s instructors teach Seattle students to be safe and responsible drivers in a fun and supportive environment. Any company engaged in something as important as teaching teenagers how to become great drivers should make connecting easy. Parents of SWERVE Driving School students are encouraged to ask questions, clear up concerns, check on progress, and generally be in touch! Are you ready to get your license and become a great driver? SWERVE Driving School is your best choice for driving school in Seattle or in a variety of Seattle area driving school locations. Simply enroll with SWERVE today by registering below or give us a call at (206) 417-5555. 30 Hours Classroom Training. A course outline will be emailed upon registration or request. 5 Hours Behind-the-Wheel Driving Lessons scheduled outside of classroom time. You can choose the times and dates that best meet your schedule via our 24 hour web scheduling system. Drives are done 1 hour at a time. A minimum of 3 drives must be completed by the last scheduled day of class. 4 Hours Drive Simulation in the Classroom. This covers hazardous conditions, road construction, etc., and is included in the posted schedule for each class. 5 Hours Behind-the-Wheel Driving Lessons scheduled outside of classroom time. You can choose the times and dates that best meet your schedule via our 24 hour web scheduling system. Drives are done 1 hour at a time. A minimum of 2 drives must be completed by the last scheduled day of class. You must have a WA State permit or a valid license from another state or country with you at all times to take lessons. All lessons are done in our school instruction vehicles, which are equipped with an instructor brake and mirror. All vehicles have automatic transmissions and are fully insured, so you do not need your own insurance to take lessons. All lessons are customized to the individual customer, and we can work on anything you wish. Lessons are available 7 days a week at all times of day. Please sign up here, then call to schedule. You're welcome to call first to check on availability, but all lessons must be paid prior to scheduling. You must have a WA State permit or a valid license from another state or country with you at all times to take lessons. All lessons are done in our school instruction vehicles, which are equipped with an instructor brake and mirror. All vehicles have automatic transmissions and are fully insured, so you do not need your own insurance to take lessons. All lessons are customized to the individual customer, and we can work on anything you wish. Lessons are available 7 days a week at all times of day. The knowledge test must be passed before we can administer the road test. The road test will be administered in the customer's vehicle; a school instruction vehicle may be used for an additional charge. 1 WA State Knowledge test. Valid for three attempts. **Knowledge testing available at Northgate and Capitol Hill only. Knowledge and Road Test 1 WA State Knowledge Test and 1 WA State Road Test (in your vehicle). The WA State Knowledge test must be scheduled and passed first and then the WA State Road Test may be taken. The Knowledge Test should be scheduled on a separate day from the Road Test. Swerve Driving School offers a variety of driving programs to meet your needs. Adult Drives: Offered in one hour increments. Packages are available. WA State Testing: Road Testing and Knowledge Testing . Don't wait! Offered by appointment.